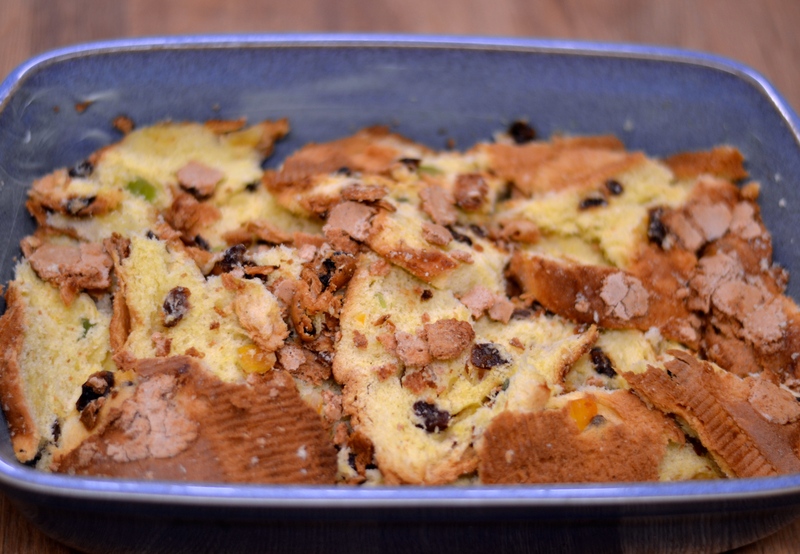 * I used panettone this time as I had some leftover from Christmas. However, had I not, I would have used either croissants or brioche, and added a couple of handfuls of sultanas sprinkled over. 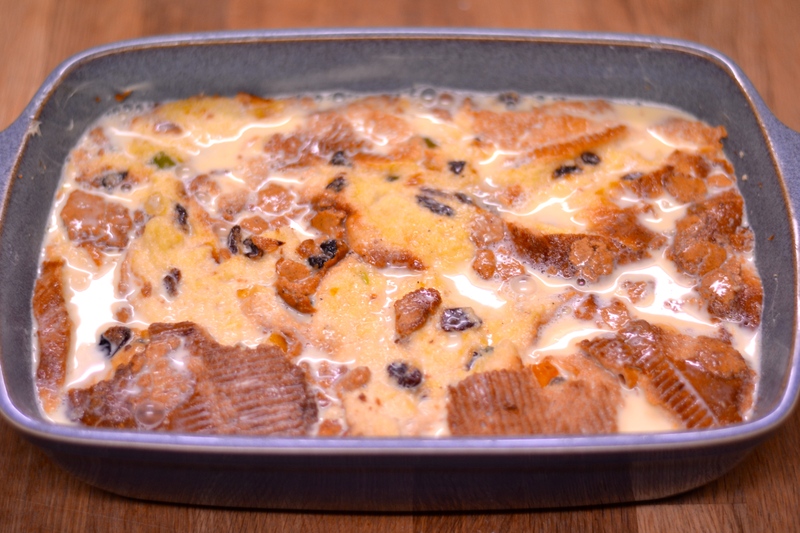 You could even use simple buttered bread, again adding some dried fruit. 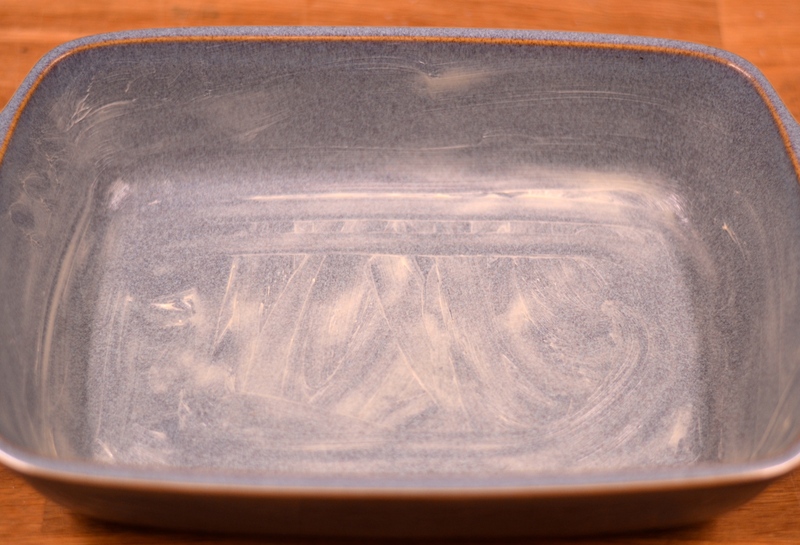 And quantities are pretty flexible – I tend to just fill the dish I’m using. But generally, 6-8 croissants/brioche rolls would be about right. 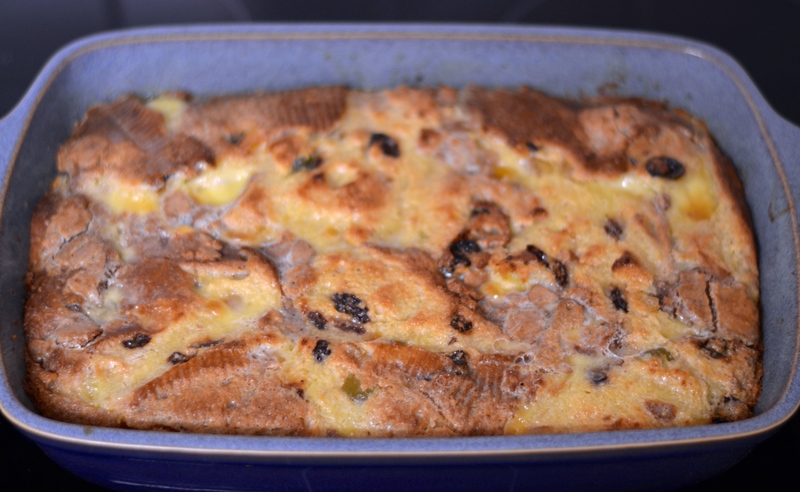 I served this with ice-cream, but it doesn’t really need anything else (although I’d still serve it with ice-cream. I love ice-cream). I watched a program the other day on BBC One, called Eat Well For Less? It looks at a family’s spending habits in the supermarket. The family featured were spending over £350 a week(!) on groceries. It was fascinating watching. It interested me that an apparently well-educated couple relied so heavily on jars and convenience food – don’t get me wrong, I am totally not dissing the use of jars and convenience food. I usually have some in my stores cupboard for when I want a quick fix. But to fully rely on them is so expensive and often not the healthiest option (compared to cooking from scratch). The family on this show had four kids, the mum was pushed for time (we can all relate nowadays) and hated cooking (I didn’t realise this was possible??). To be fair, she didn’t trust her cooking skills. So she relied on jars of sauces a lot, including chilli con carne sauce. I was a little surprised (ok, pretty incredulous) that the TV show, instead of teaching her to cook a chilli from scratch – which is so friggin’ simple – they introduced her to cheaper jars? Now it just so happens that I was planning to cook a chilli that day (I know! What are the chances?! 😜). I wasn’t planning to blog it though. I figured everyone has their own chilli recipe so they didn’t need mine. But maybe there’s more folk out there who don’t realise how easy it is to cook a chilli from scratch? Who use jars of sauce too? If I could help one person to make a chilli – without the use of any jars – who hasn’t before, I’d feel like a pig in the proverbial (my mum’s told me I have to stop swearing on here 😳). So here it is. My chilli recipe. 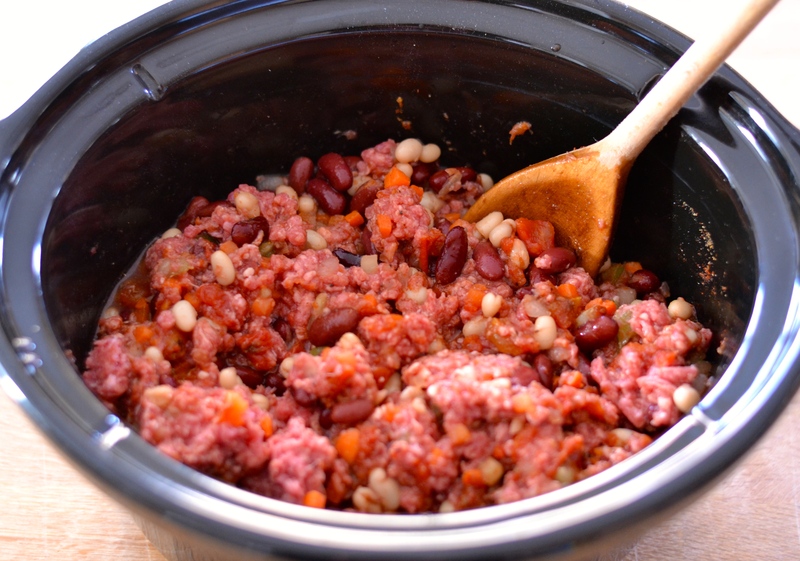 I slow cook it but you could cook it on the stove, just cook it on low for a couple of hours – mince needs a long, slow cooking to be really good, in my humble opinion. 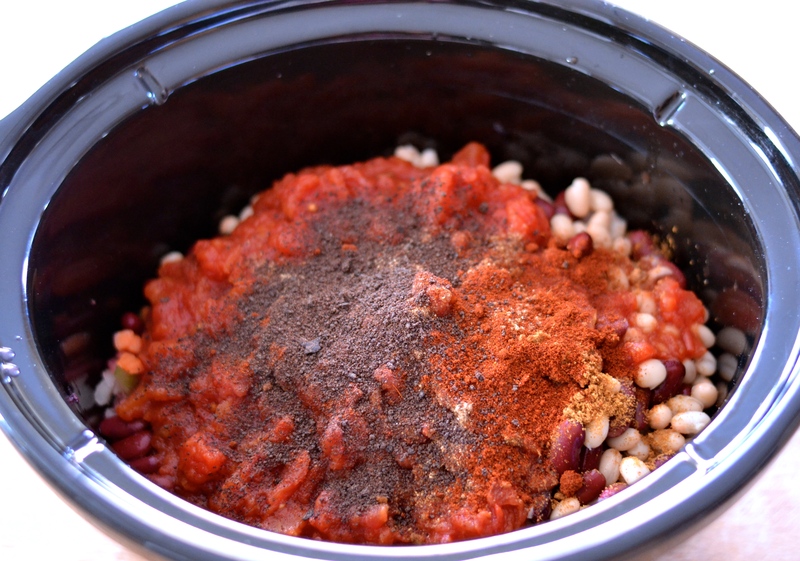 Because I’m incredibly lazy, I literally just threw all the ingredients into the slow cooker, gave them a good mix, turned it to high and let it cook for about 4-5 hours (low for 6-8 hours). 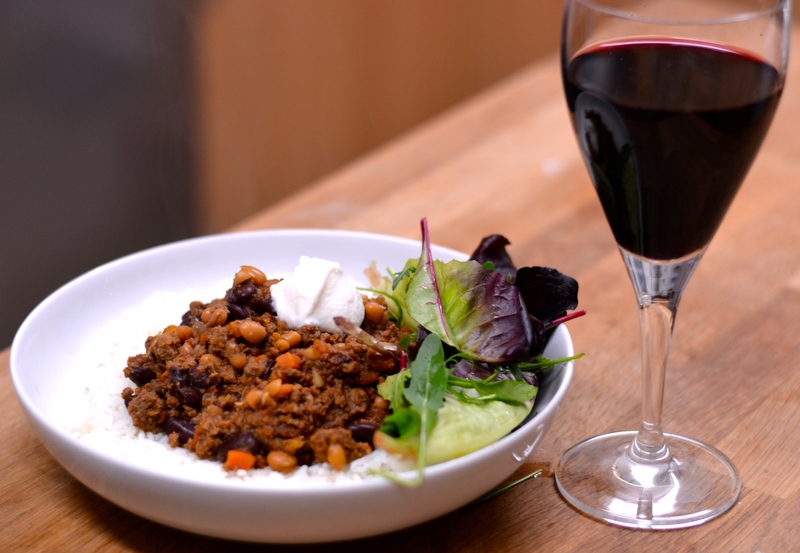 Give your chilli the odd stir whilst it’s cooking, and add more water if you feel it looks too dry. Job done. However. 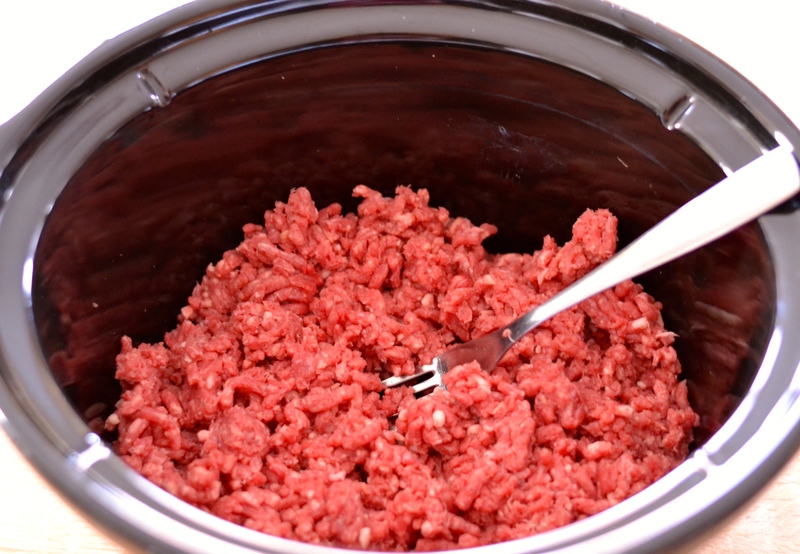 Not browning the mince first, does give it a slightly different texture. This doesn’t particularly bother me, especially when it’s just for the family. 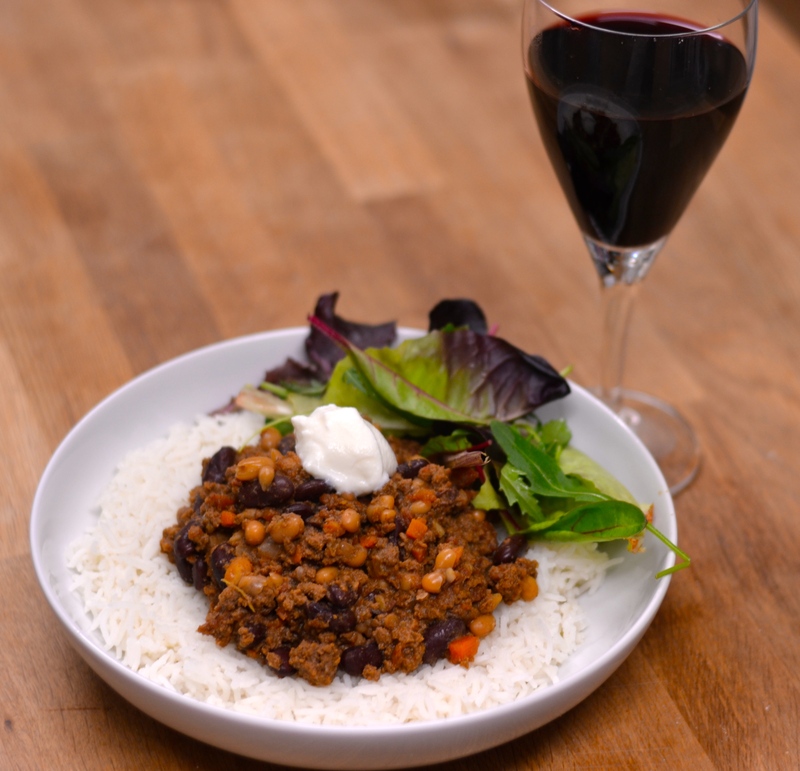 But if you’d prefer, brown the mince off first in a pan on the stove before tipping it into the slow cooker and adding the other ingredients – if you’re making this on the stove then you might as well brown off the mince first. I’m more inclined to brown the mince first if I’m making it for guests! I used Sainsburys chopped vegetables instead of an onion. 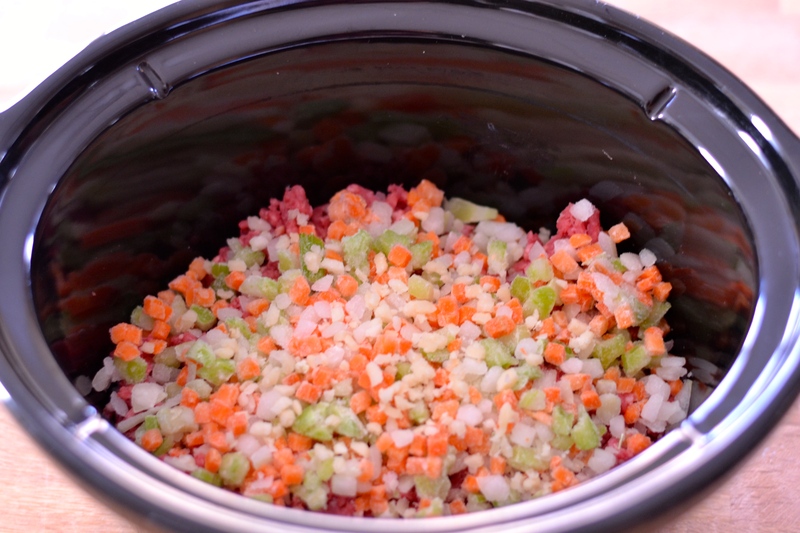 I love this product, it’s chopped onion, carrot and celery. 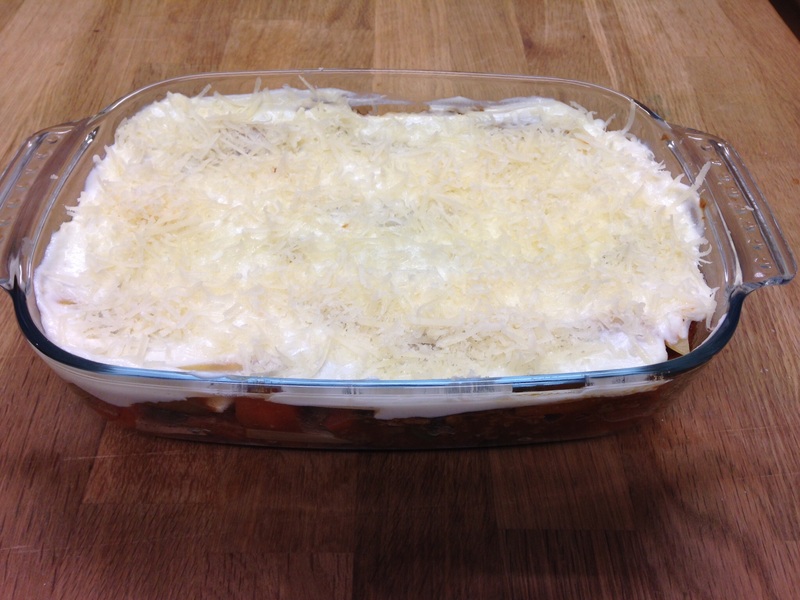 I tend to add it to all my mince dishes as you’re adding veg, which practically disappears by the time it’s cooked. Great with kids! I also added a tin of haricot beans (baked beans without the tomato sauce) because it bulks out the chilli a bit more, and I can sell it to the kids as ‘mince and beans’. I’m always looking for ways to ‘sell it to the kids’ – I sometimes use cannelini or barlotti beans, depending what I’ve got in the cupboard. I only used mild chilli powder, again because of the kids, but obviously make it as spicy as you like. And if you want it a bit more meaty, bacon is a great addition (add when browning the mince). And in case it interests anyone, I worked out my chilli cost £4.95 in total – but that’s with the extra beans which you could leave out (haricot beans are 60p a can!). And it wasn’t the cheapest mince. It served 2 adults, 4 children, and with a portion to spare. I’m not a ‘budget cook’ per se, but I like to think I don’t spend astronomical amounts unnecessarily (we need all the spare pennies for the wine….). Less than a fiver to feed the family, with lunch for me the next day, I count that as fairly economical. Result! I don’t make the claim in the title lightly. I’ve made a lot of chocolate chip cookies in my time. Different recipes, all claiming to be great. I found this recipe on Pinterest, it’s from the New York Times. They claimed it was the best, and by jove, I fully agree! However, this does depend on what you’re looking for in your cookie. Are you looking for a lovely, crunchy edge? 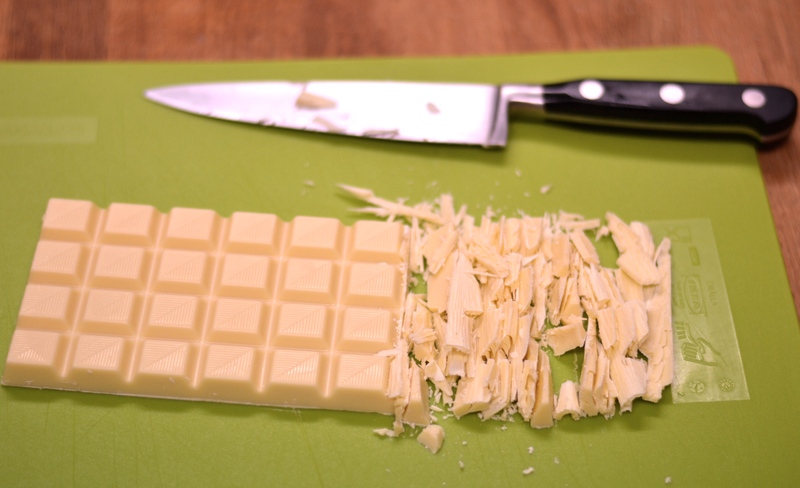 A buttery, chewy middle? A wealth of chocolate chips? Yes? Then these are the cookies for you! I like to think of them as the classic American chocolate chip cookie (American friends, please don’t shoot me down in flames here). But regardless of all of that, these are a good cookie. Make them, and tell me what you think! 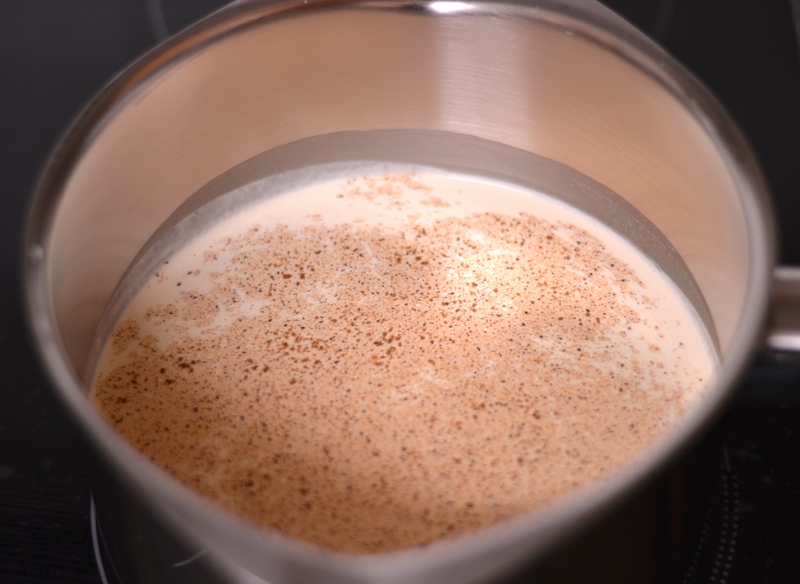 Cream the butter and sugar together. 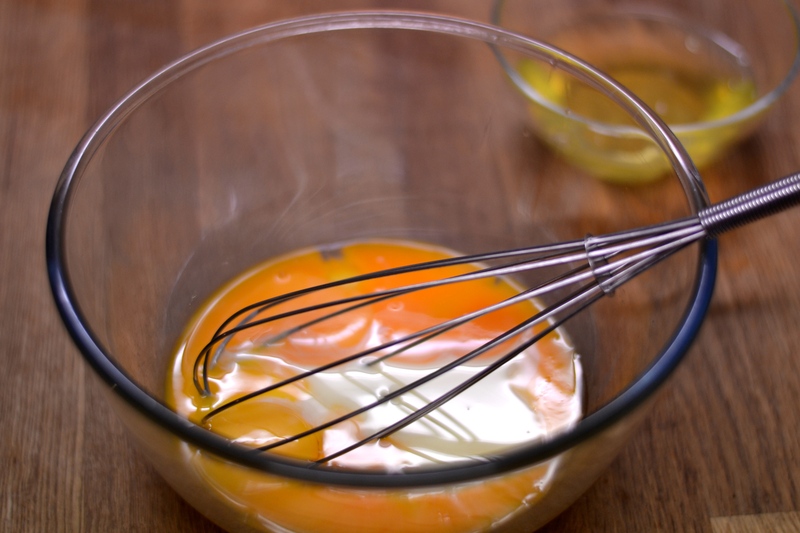 I used my mixer for this, but you could do it with a hand-mixer, or even by hand. Creaming isn’t as important for biscuits as it is for cake. Really just give them a good old mix. Next beat in the egg and the vanilla essence. 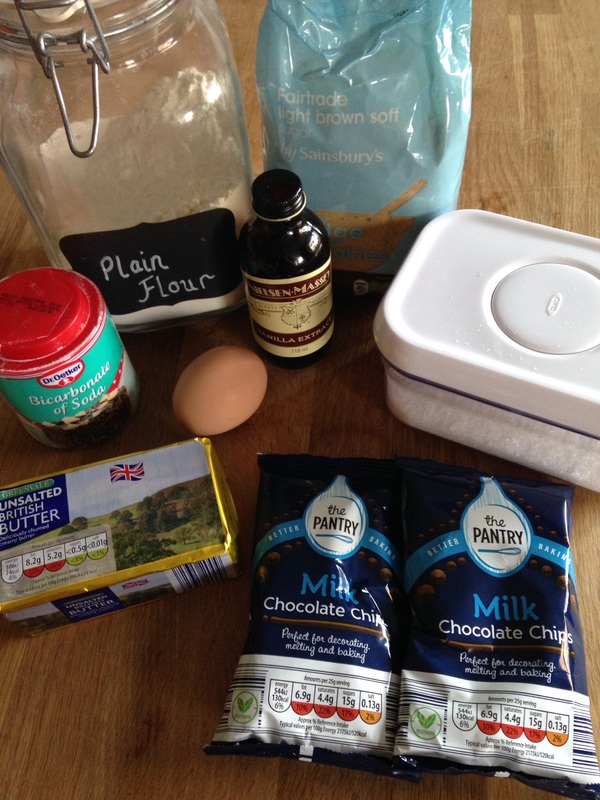 Sift the dry ingredients (flour, bicarb, baking powder and salt) into the bowl, then add the chocolate chips and give it a good mix. 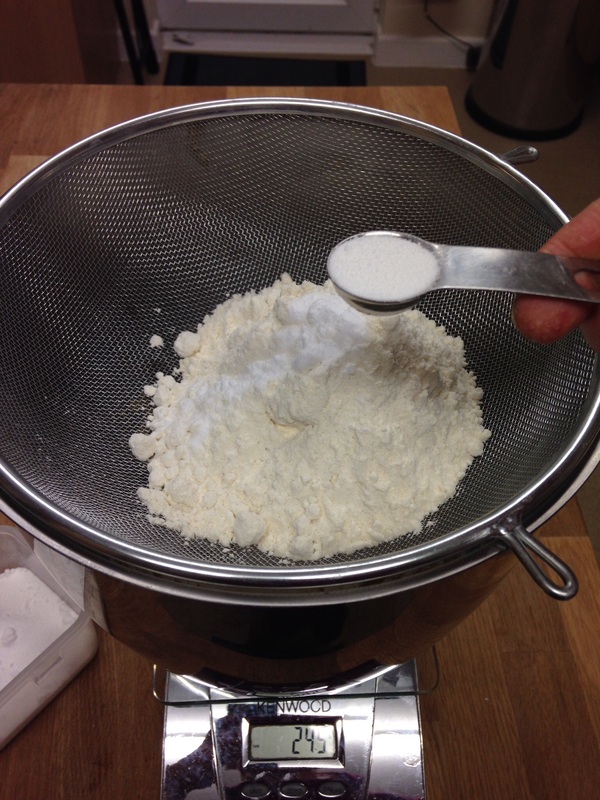 If you’re doing this by hand-mixer or by hand, you’re probably as well getting stuck in with your hands as the mixture becomes quite stiff. 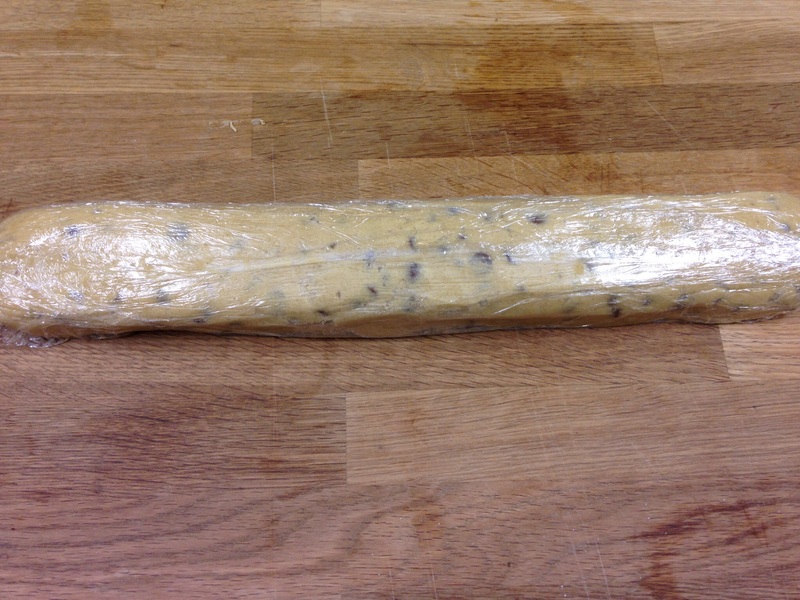 I tend to spoon this out of the bowl onto clingfilm and roll it into a sausage (you need a fairly big piece of clingfilm to do this), before popping it into the fridge for at least a couple of hours. 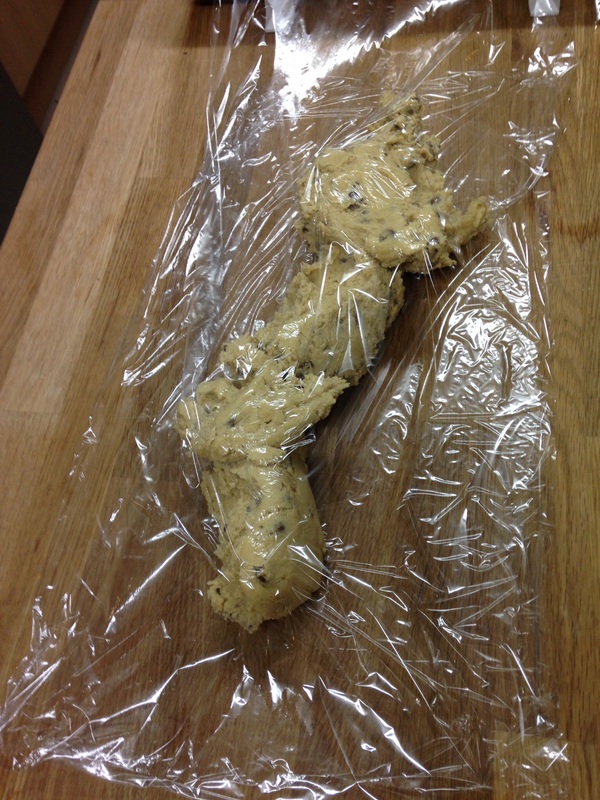 The dough will keep quite nicely in the fridge for days. Or you can even freeze the dough. 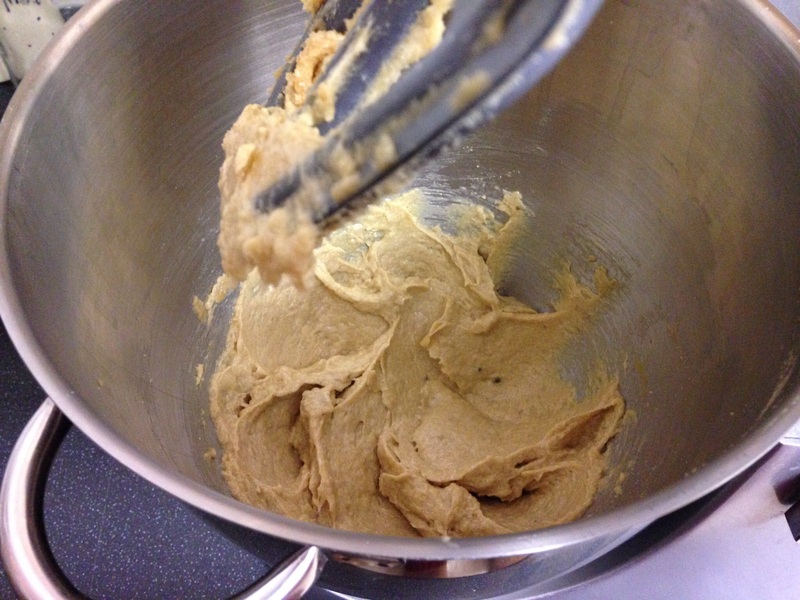 You need to refrigerate the dough before baking it, otherwise the cookies will spread too much. 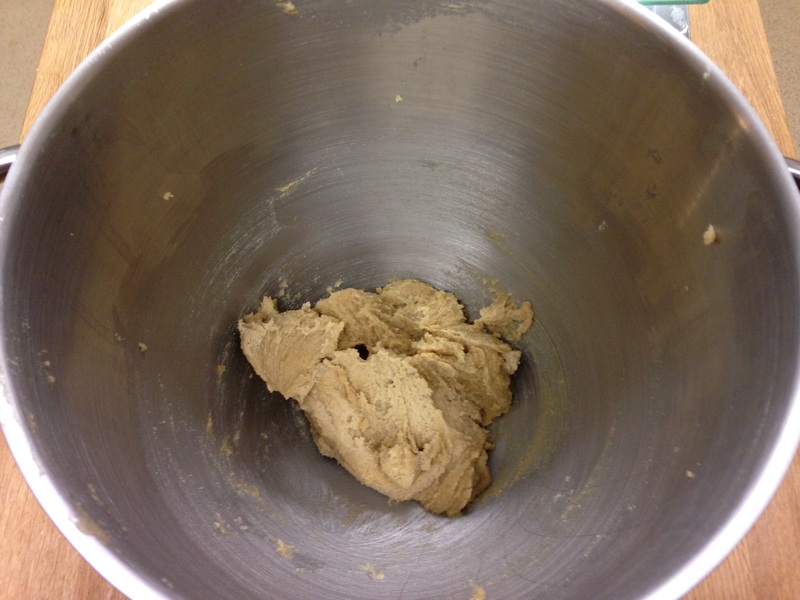 When you’re ready to bake the dough, preheat your oven to 170C (fan). 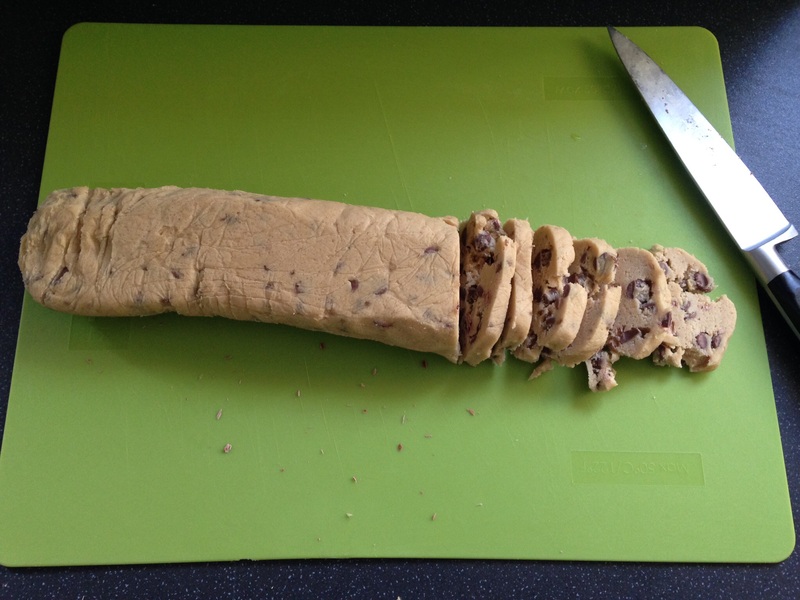 Take the dough out of the fridge and cut it into slices. 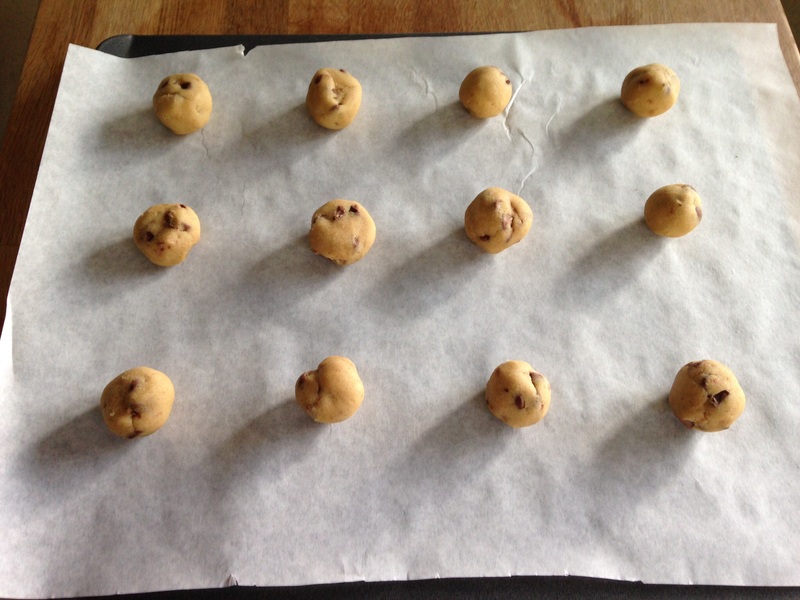 Roll each slice into a nice little ball, and lay on baking parchment/paper on a baking tray. Space them nicely apart as they will spread a fair bit (even after refrigeration) once in the oven. Pop them into the oven for about 10-12 minutes. Keep an eye, as they don’t take long and you want to get them out just as the edges are starting to brown. I’m still getting used to my oven, and would say that mine are slightly overcooked (oops!). 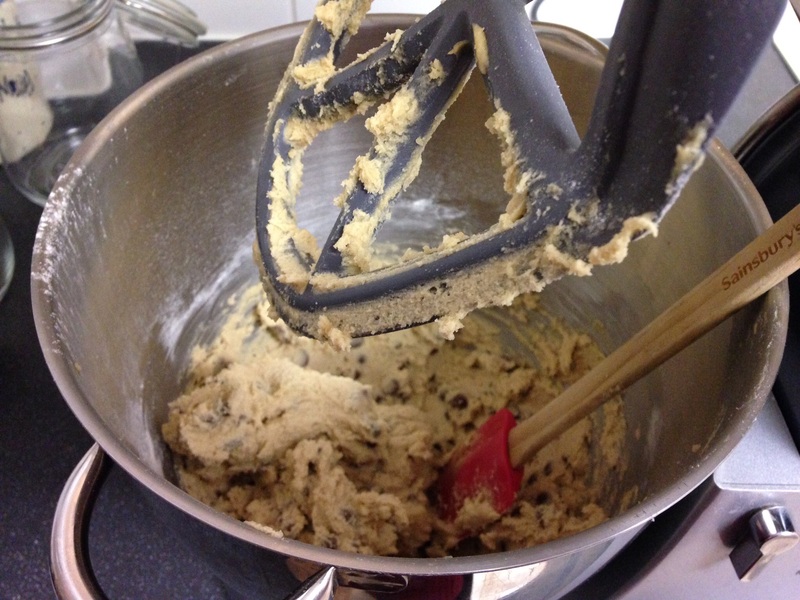 I got 38 cookies out of this mix (excuse the hand of an overeager 3 year old!). 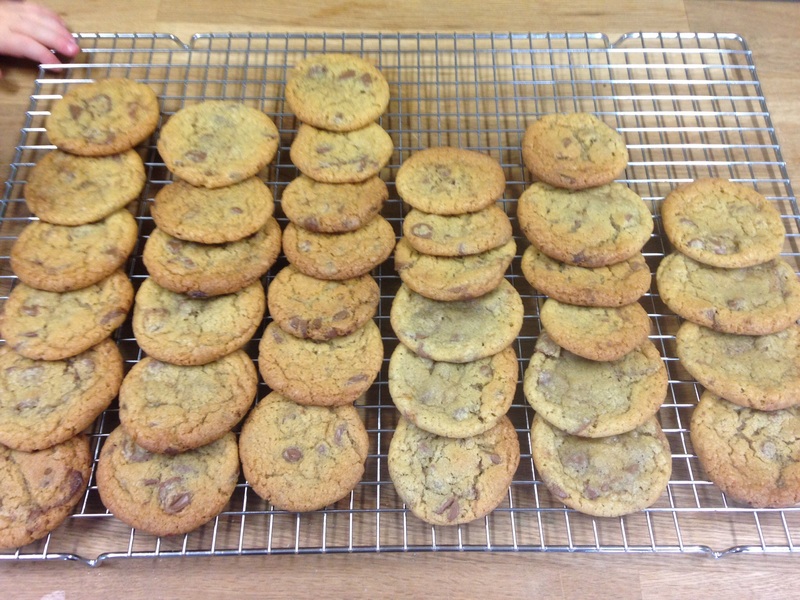 My cookies slightly vary in size – obviously because I’m catering for adults and children alike (ahem). These will keep in an airtight container for at least a week – if not longer, they’ll just get a bit harder. I hope you find these as ridiculously good as I do. 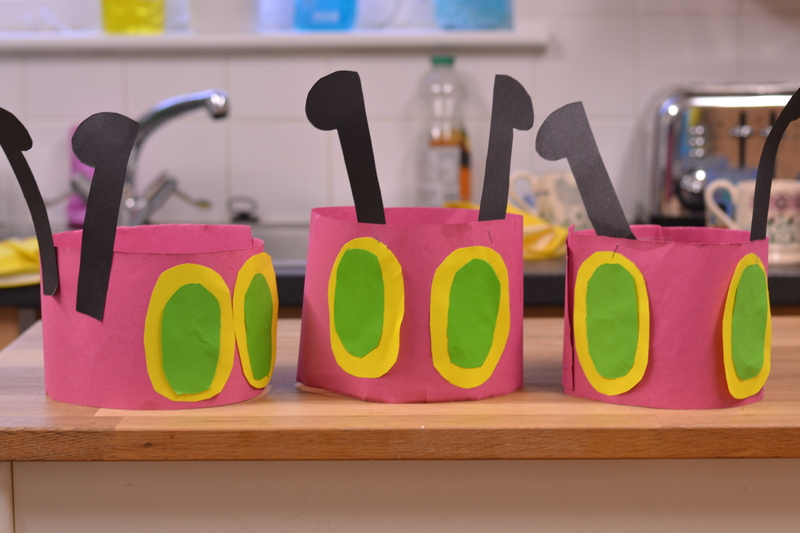 Now all I’ve got to do is not eat them all…. The new cooker is awesome! It does this amazing thing, that when you turn the heat up, it gets hotter! And when you turn the heat down, guess what? It cools down!! Like, immediately – no waiting half an hour for it to return to a temperature cooler than the sun! Amazing. I’m one very happy camper. 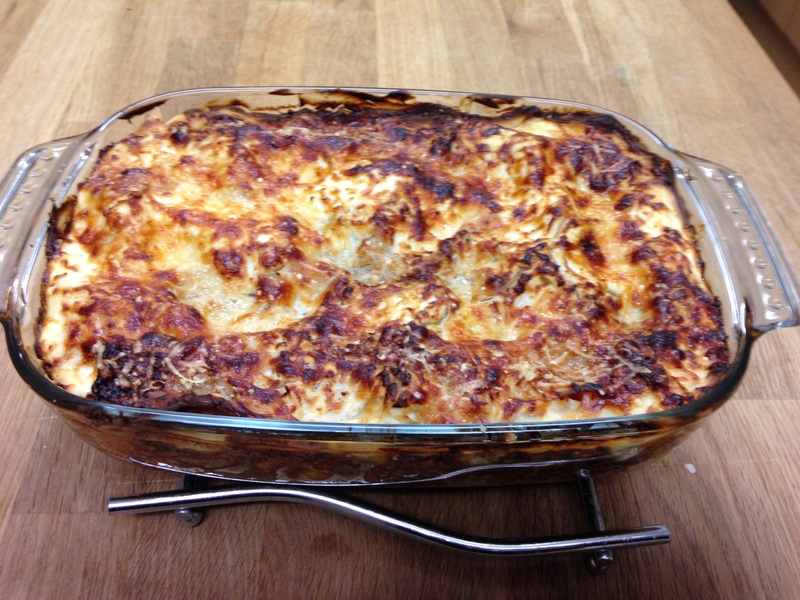 So tonight we had another ‘adult’ meal, and I made veggie lasagne (the kids had mac’n’cheese). The ‘skinny’ in the title is slightly misleading. By ‘skinny’, I mean relatively, when compared to normal lasagne. I probably wouldn’t go so far as to class this as diet food – but it’s definitely not as bad for you as the meaty, cheesy originator of the name. 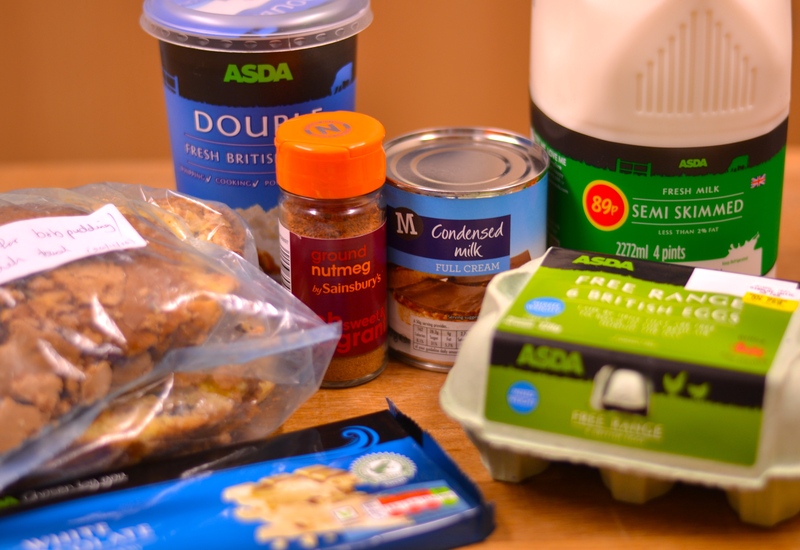 I try to include one veggie meal in the weekly menu – it definitely helps to reduce the weekly budget a bit, and hopefully we’re doing our bit for the planet as well? There’s a fair few ingredients in that there photo. But it’s mostly veg. It’s totally up to you what you put into your sauce, which is just a bolognese really. On this occasion I had some veg to use up (see the little bowls), plus I chucked in the leftover pizza sauce from the other day (the white lidded tupperware). 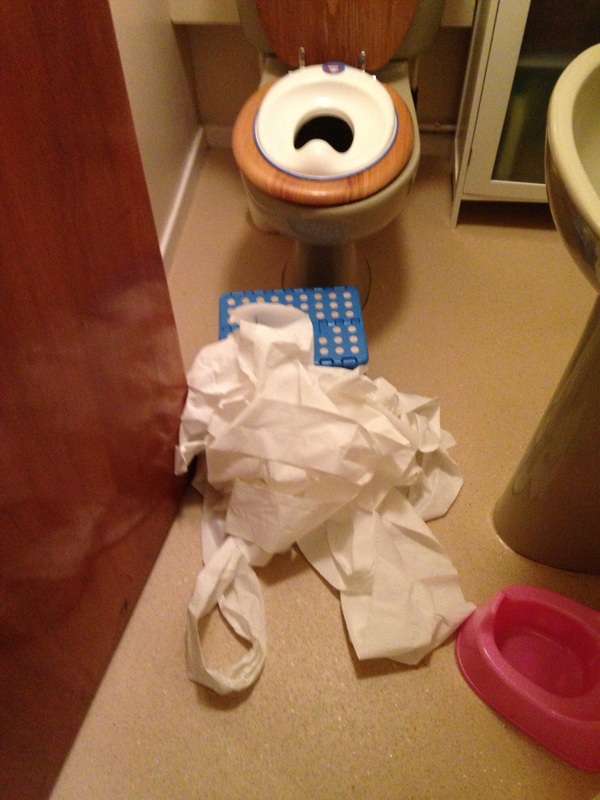 I’m a great believer in ‘chucking stuff in’. Any leftovers, if you can use them, fantastic. I hate waste. I didn’t have any chopped tomatoes so I had to use passata. Again, use what you’ve got. This is why I love cooking, you don’t need to have every little ingredient in a recipe. You can often change to suit what’s in your cupboard. 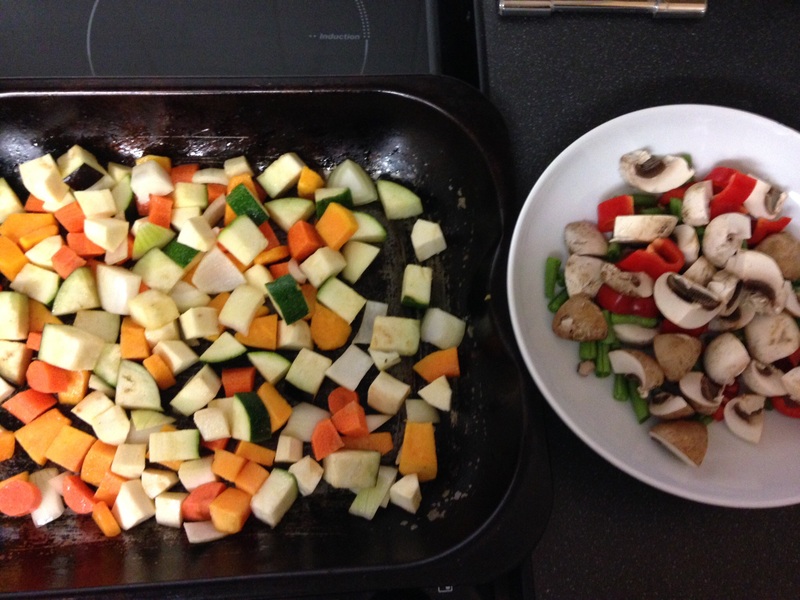 Today I had carrot, parsnip, aubergine, courgettes, onion, sweet red pepper, mushrooms, green beans and butternut squash (which I buy ready prepared – I honestly can’t be arsed peeling and cubing a squash). I cut them all up into small cubes and placed in a roasting dish with about one tablespoon of olive oil. 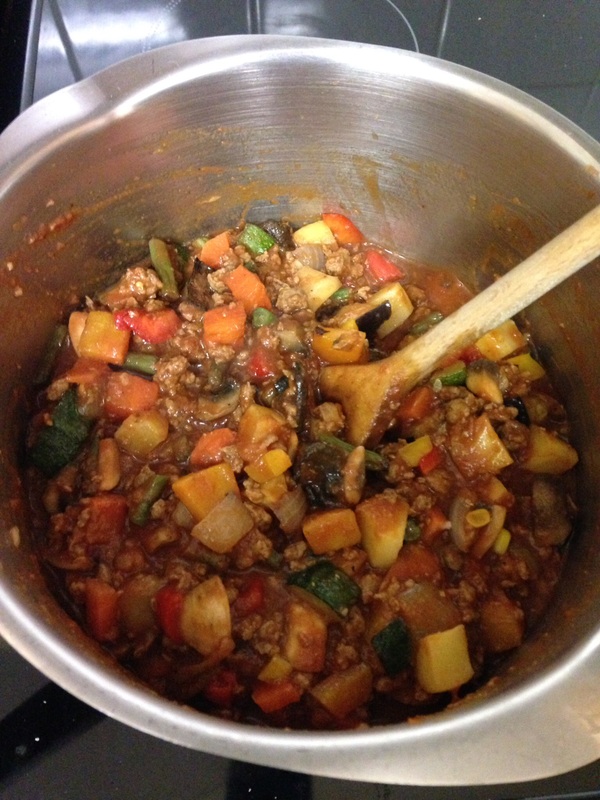 Once your veg is roasted, heat about one teaspoon of oil in a pan and add your Quorn mince (if using). I used the whole bag of Quorn mince, but I only used half the resulting sauce (I’ve frozen it for next time). Start it cooking then add all of the remaining sauce ingredients plus some water to make it ‘saucy’ (a technical term I’ll have you know). This is what mine looked like. I then let it simmer for about 15 minutes. 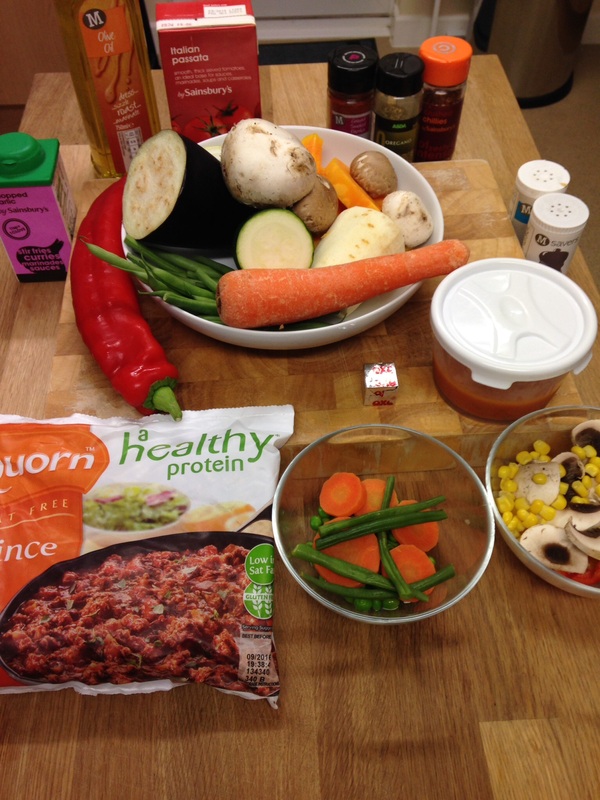 Unlike with meaty mince, you don’t need to simmer Quorn forever (it’s pretty soft already), and all the ingredients here were cooked, so it didn’t take long. 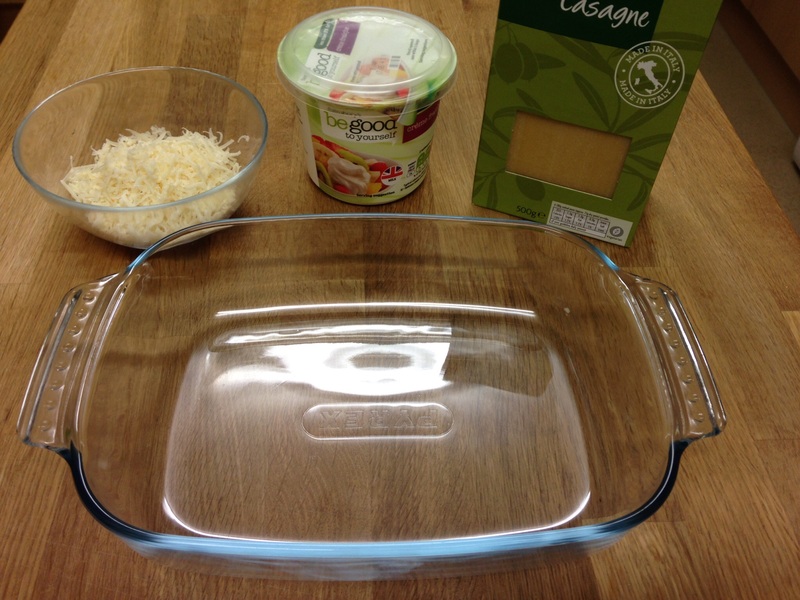 Layer up, starting with the sauce, then lasagne, then sauce, lasagne etc. I used 4 layers of lasagne. 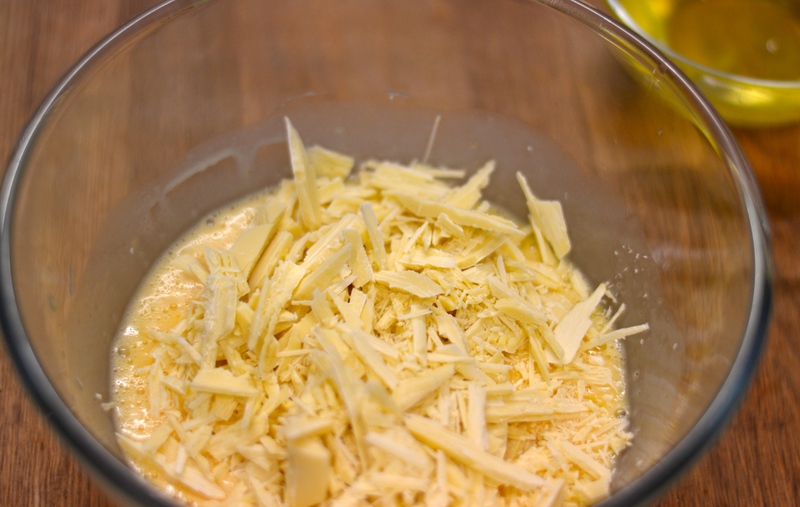 After the last layer of lasagne I spread over the creme fraiche and sprinkled with the parmesan. 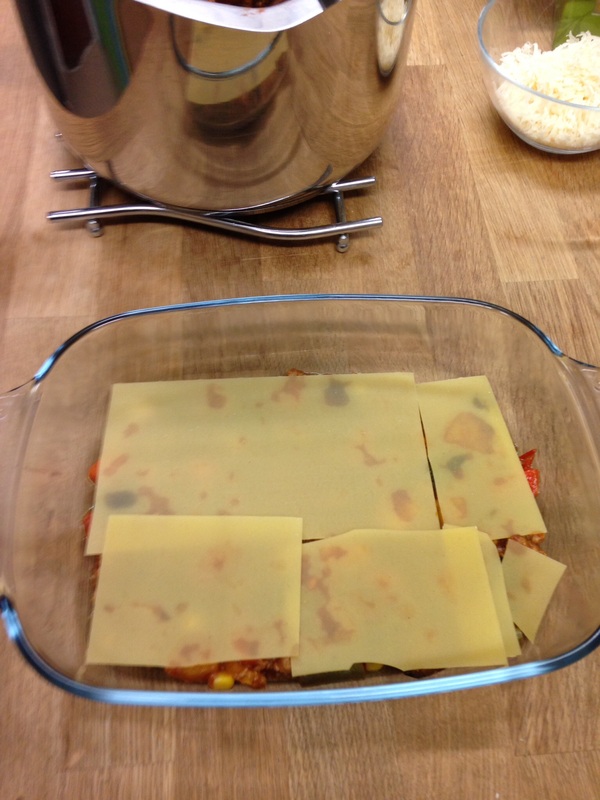 Chuck it in the oven for about 30 minutes, or until the top is lovely and browned. Because I was serving the Husband a veggie dish, I always feel I’ve got to compensate with something else (food wise I’m talking!). 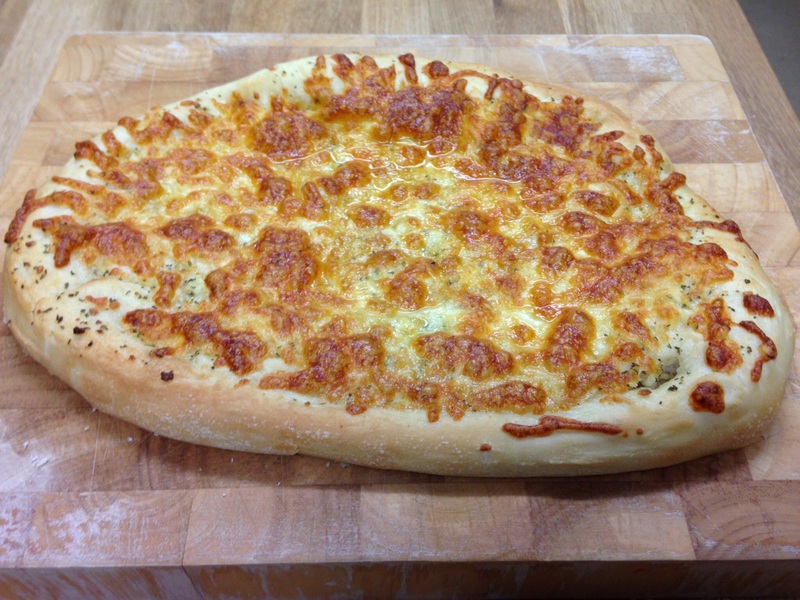 So I made some garlic bread using the same pizza base dough recipe from the other day (in the breadmaker), slathered it in a mixture of butter, garlic, parsley and salt (the parsley really only adds the green bits) then sprinkled over some of the cheese leftover from the pizza. Et voila. And wine was consumed. Obviously. It was Saturday night after all, and we have kids, so this is about as rock’n’roll as we get.